I’m glad we visited Japan during the winter. Yes, we missed the amazing cherry blossom season by picking to visit the Land of the Rising Sun during a cold January in 2011, but we were rewarded, among other things, with the Opening Day of the first Honbasho of the year. 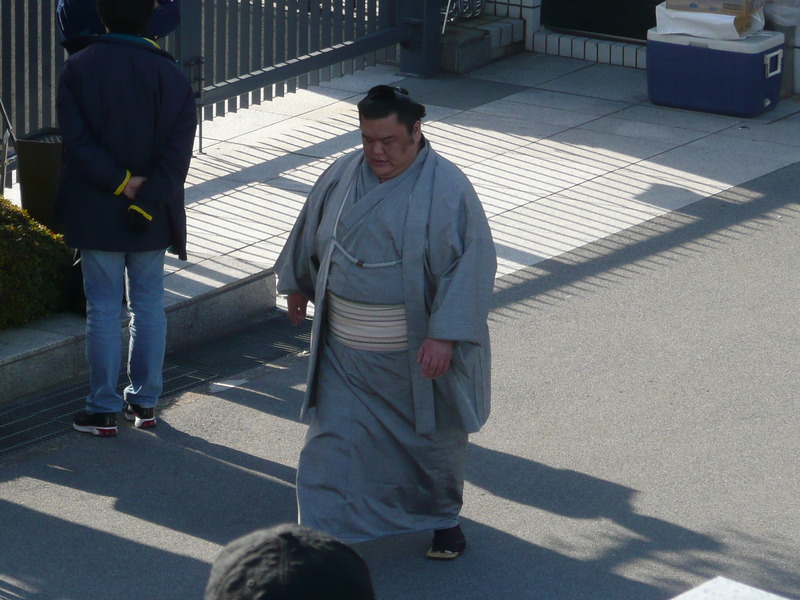 The fascinating sumo wrestling world awaited! 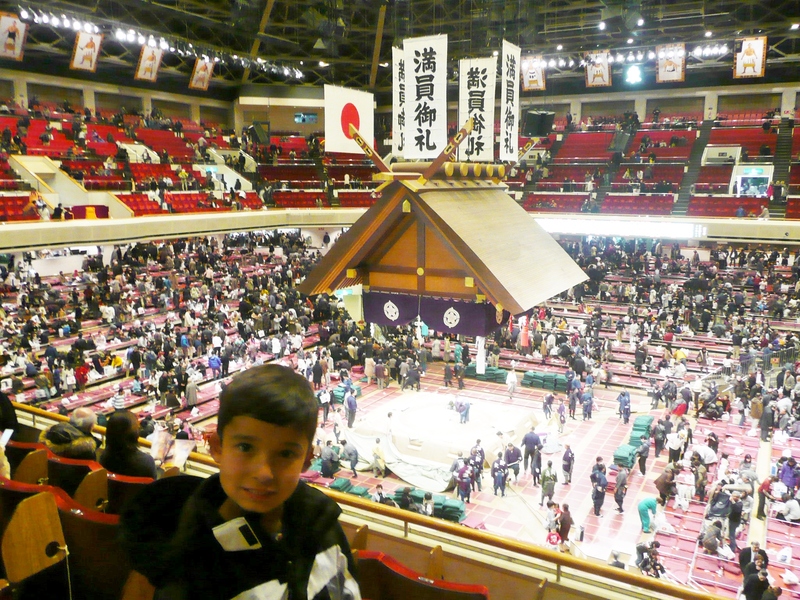 Every year there are six honbasho (official sumo tournaments) in Japan. Three are held in Tokyo, and one each in Osaka, Nagoya and Fukuoka. 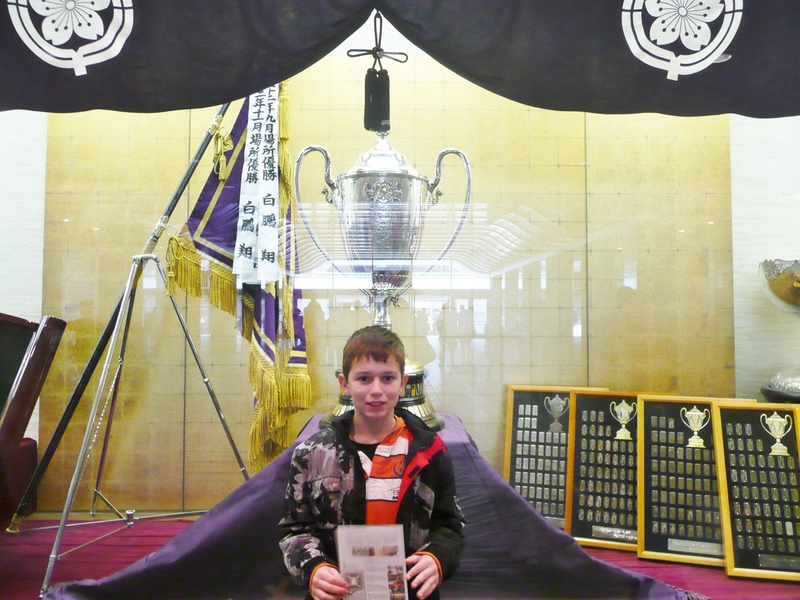 We arrived at the Ryogoku Kokugikan, Tokyo’s Sumo Hall, before noon. 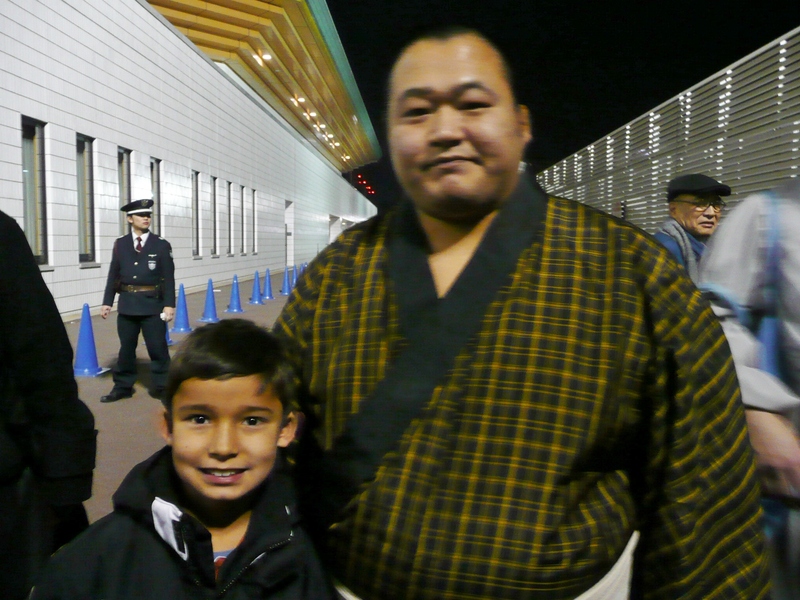 The boys were really excited and as we were waiting outside for the gates to open, we were very lucky to see some of sumo’s biggest stars or rikishi arrive at the venue. They walked by us like any other person. 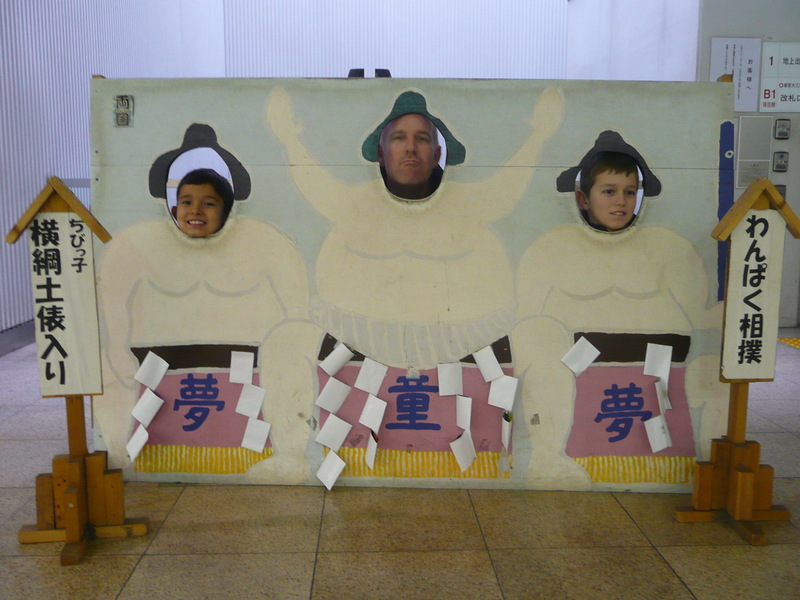 No security, no bodyguards (although, these are sumo wrestlers. I doubt they even need a bodyguard… ). Vincent was blown away by the fact that these were super stars walking among fans and no one was swarming them or bothering them at all. He compared it to an NFL football player walking through the main door at a stadium on game day. He said it would be a frenzy, people would ask for pictures, autographs and not to mention it would be kind of dangerous for the star. Ah! 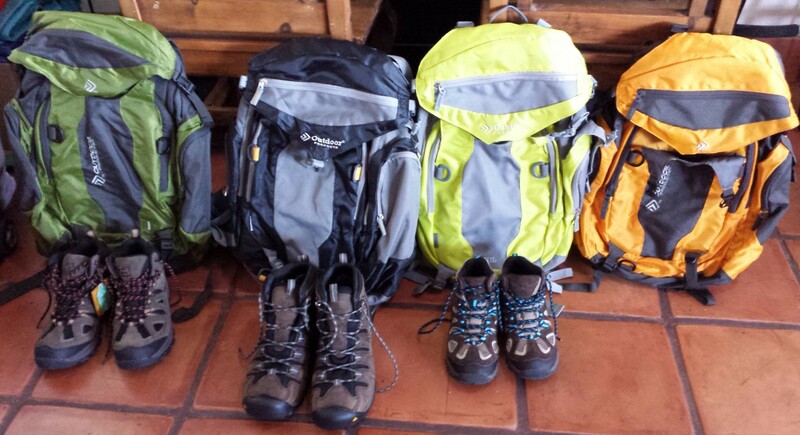 The beauty of seeing your children realize those cultural differences! 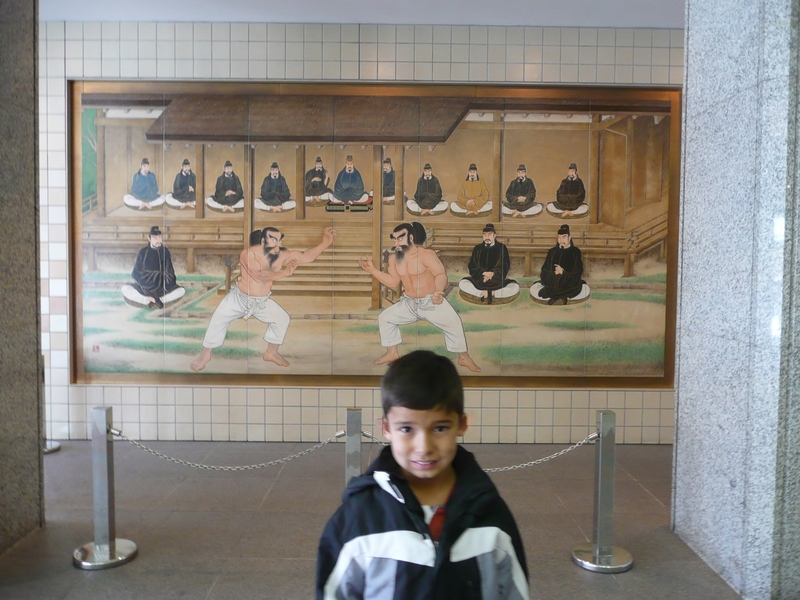 Inside, we visited the small Sumo Museum and learned a little bit more about this fascinating sport. Sumo is a competitive full-contact wrestling sport where a rikishi (wrestler) attempts to force another wrestler out of a circular ring (dohyō) or to touch the ground with anything other than the soles of the feet. 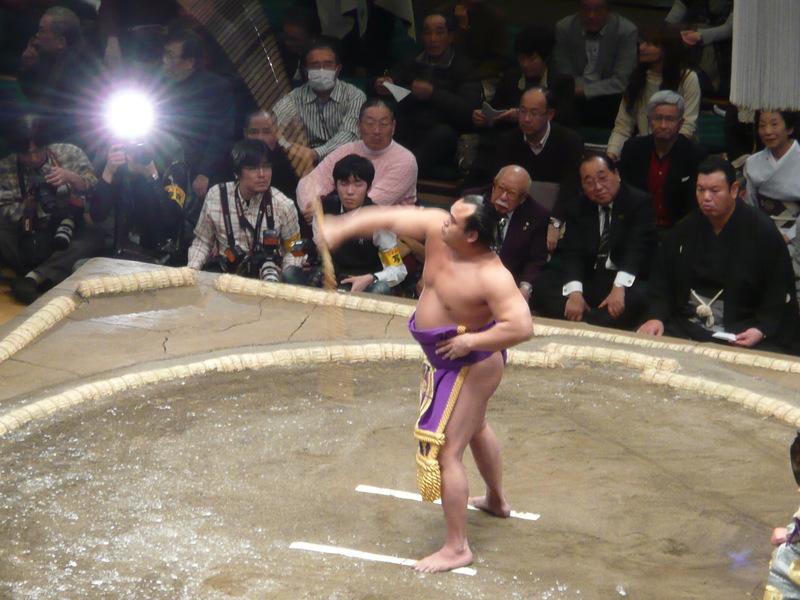 Historians agree that the origins of sumo date back 2000 years. However, it never really flourished as a spectator sport until the early 1600’s. 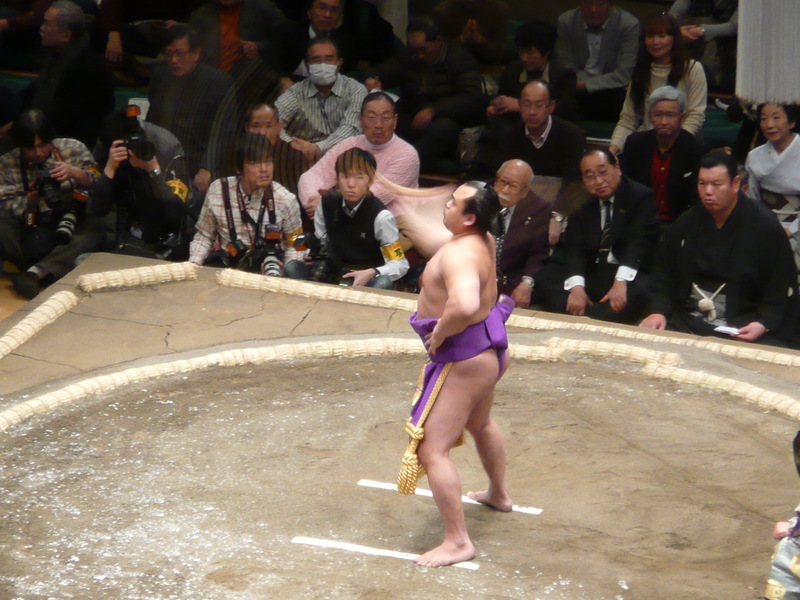 Many ancient traditions have been preserved in sumo, and even today the sport includes many ritual elements, such as the use of salt purification, from the days when sumo was used in the Shinto religion. Shinto is the native religion of Japan and is more a set of rituals and ceremonies than a system of beliefs or a definite code of ethics. The word itself means “way of the gods.” Sumo was originally performed to entertain the gods (kami) during festivals (matsuri). 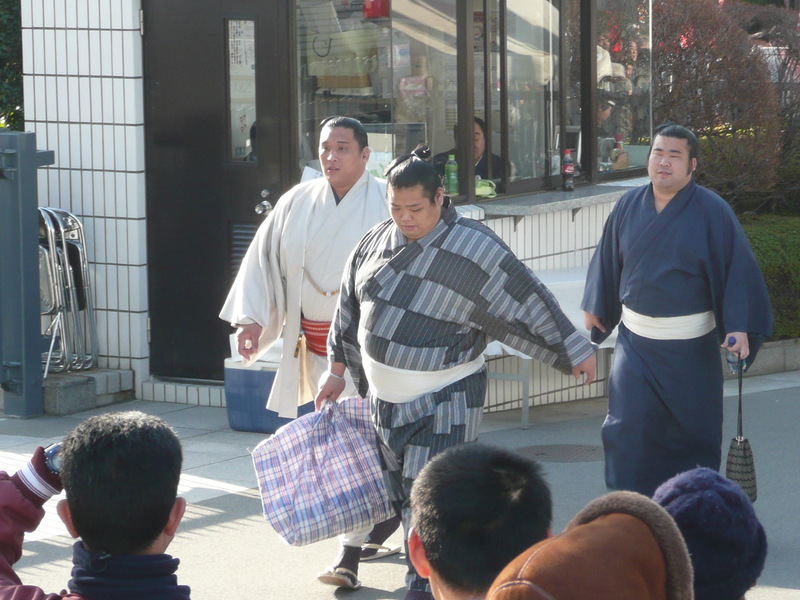 Life as a wrestler is highly regimented, with rules laid down by the Japan Sumo Association. 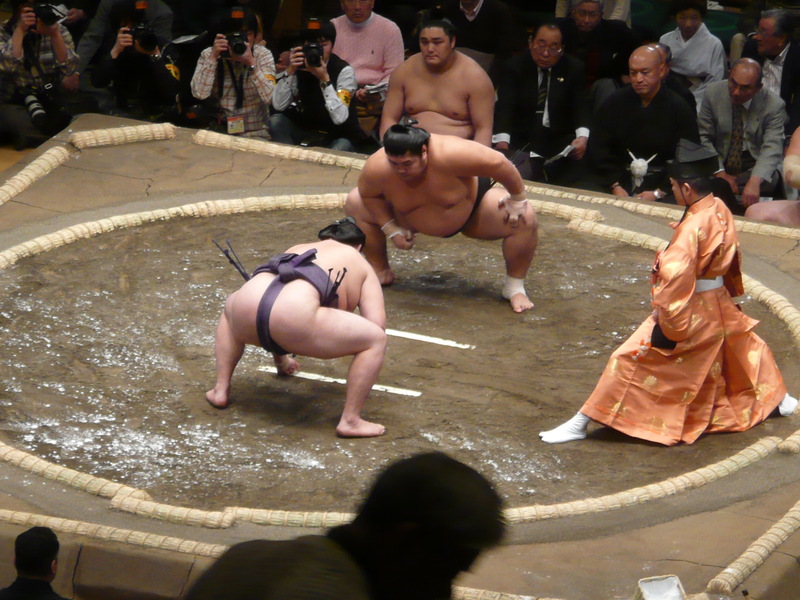 Most sumo wrestlers are required to live in communal “sumo training stables”, known in Japanese as heya, where all aspects of their daily lives, from meals to their manner of dress, are dictated by strict tradition. Breaking the rules can result in fines and/or suspension, not only for the offending wrestler, but also for his stablemaster. 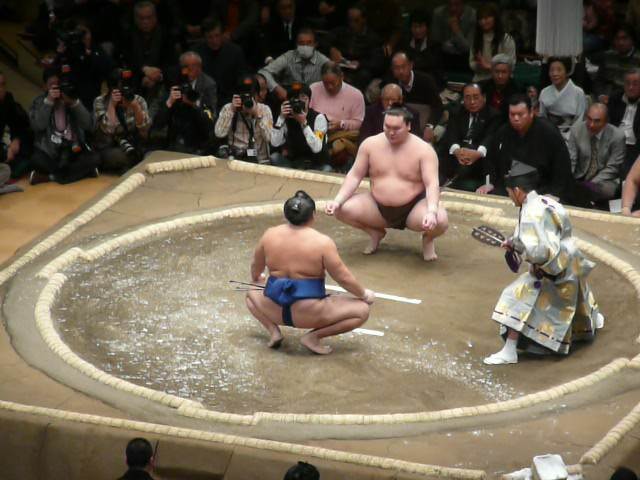 All sumo wrestlers take wrestling names called shikona, which may or may not be related to their real names. They have little choice in their name, which is given to them by their trainer (or stablemaster), or by a supporter or family member who encouraged them into the sport. 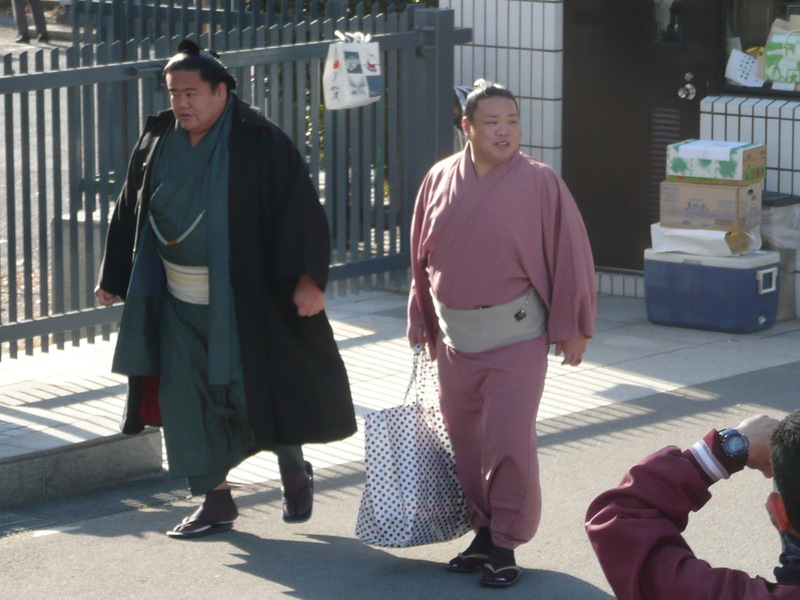 The wrestlers are expected to grow their hair long to form a topknot, or chonmage, similar to the samurai hairstyles of the Edo Period and they are also expected to wear the chonmage and traditional Japanese dress when in public. Wrestlers are not normally allowed to eat breakfast and are expected to have a form of ‘siesta’ after a large lunch. The most common type of lunch served is the traditional sumo meal of chankonabe which consists of a simmering stew cooked at table which contains various fish, meat, and vegetables. It is usually eaten with rice and washed down with beer. This regimen of no breakfast and a large lunch followed by a sleep is intended to help wrestlers put on weight. We didn’t know much about sumo and it’s rules, so we made a lot of questions and read all the information given to us. 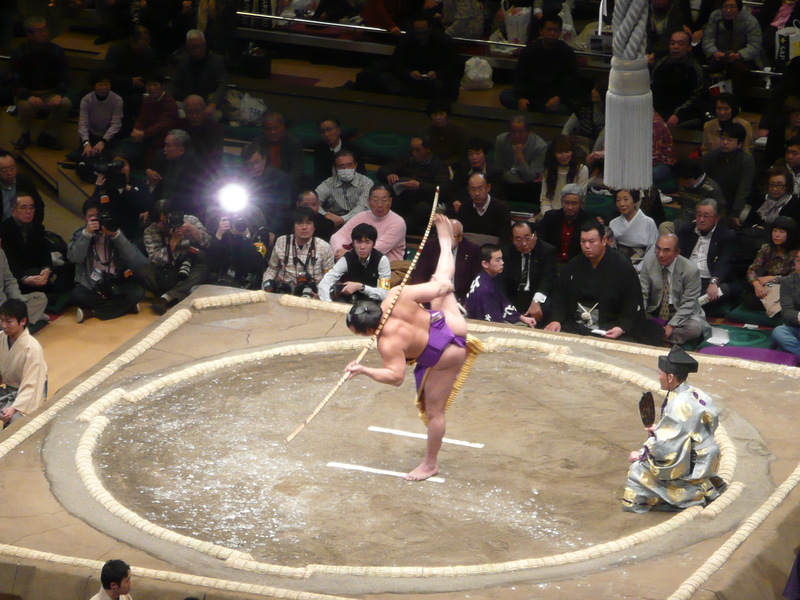 The arena or dohyō is a ring made of rice-straw bales on top of a platform made of clay mixed with sand. 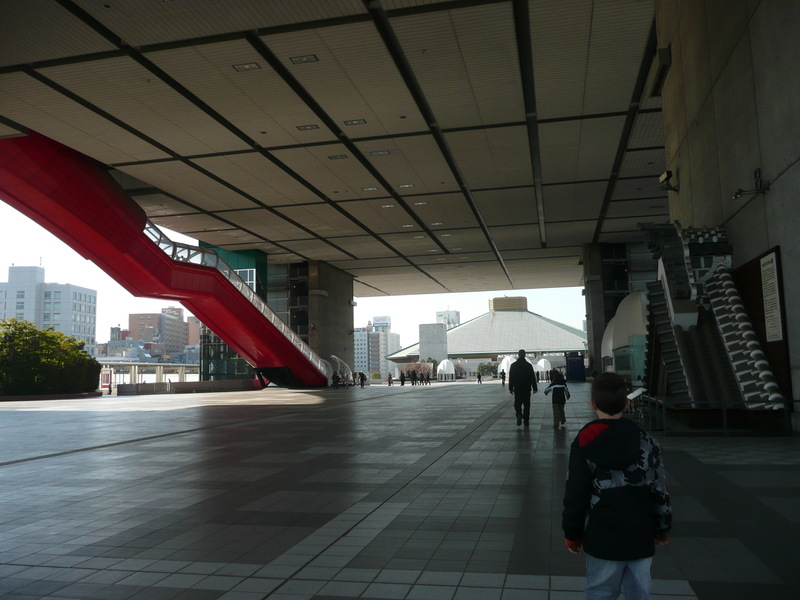 A roof resembling that of a Shinto shrine is suspended over the dohyō. Four tassels on each corner of the canopy represent the four seasons, the white one as autumn, black as winter, green as spring and red as summer. Kelp, cuttlefish, and chestnuts are placed in the ring along with prayers for safety. So we were ready for the first match. The rikishi or wrestlers are grouped into two groups, East and West, and each group takes a turn entering the ring. The lowest-ranked rikishi enters first and walks a complete circle around the ring followed by the other rikishi in ascending order according the rank. Once the last rikishi in the group has been introduced, the rikishi, who are facing the spectators, turn inward and face each other around the ring. 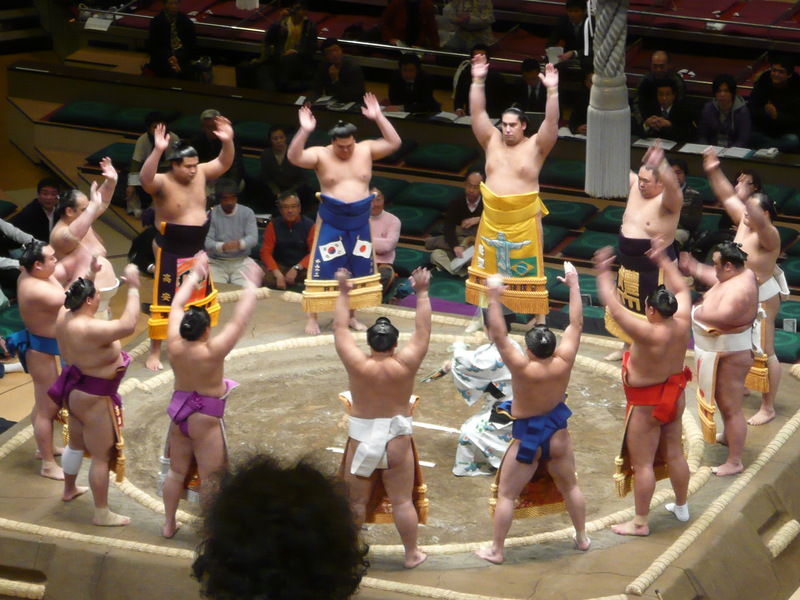 After clapping their hands once, they raise their right hand, lift their kesho-mawashi (decorative aprons created for the ring ceremony), and finally raise both hands in unison. This tradition goes back to the samurai days and represents the rikishi showing each other that none is armed. 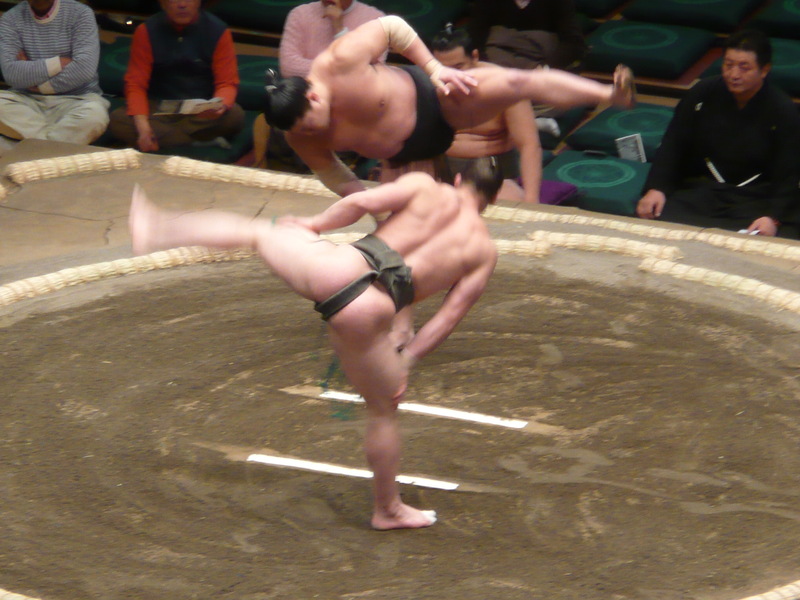 Once the actual bouts begin, the two rikishi spend several minutes before their match lifting their legs high in the air and stomping them down, a practice said to scare away any demons. They also throw several handfuls of salt into the ring, which is said to purify the ring. 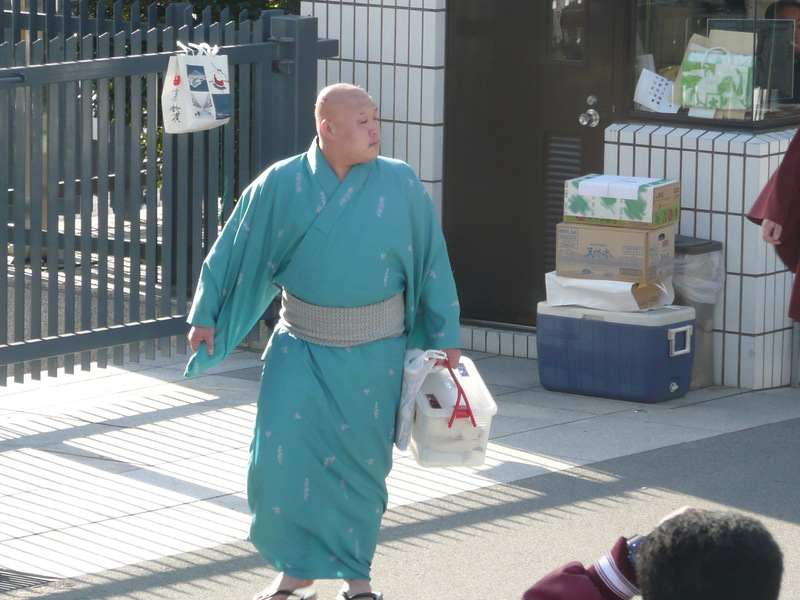 Many rikishi will also sprinkle salt around their bodies as a means of protecting them from injury. They also slap their face and belly to intimidate their opponent. The boys found this hysterical! We liked the bout preparation more than the bout itself! The bouts last for a couple of seconds or up to a minute. 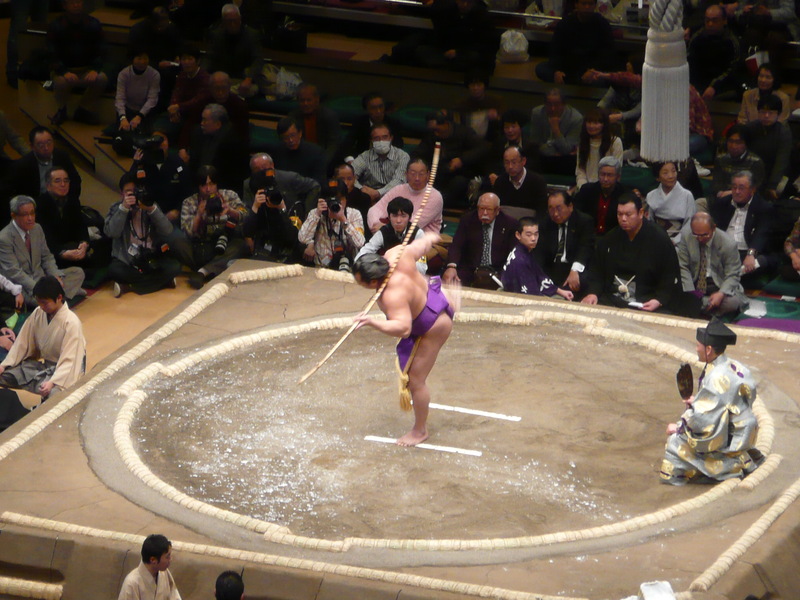 A rikishi loses the match when any part of his body other than the bottom of his feet touches the dohyo or when he is pushed or thrown outside of the ring. At the end of the day, the makuuchi division is definitely the main attraction. The arena is now packed and you feel the excitement. This division contains the top 42 rikishi in the world and these are the hardest fighting, most experienced players. The highest ranked wrestler is the Yokozuna. 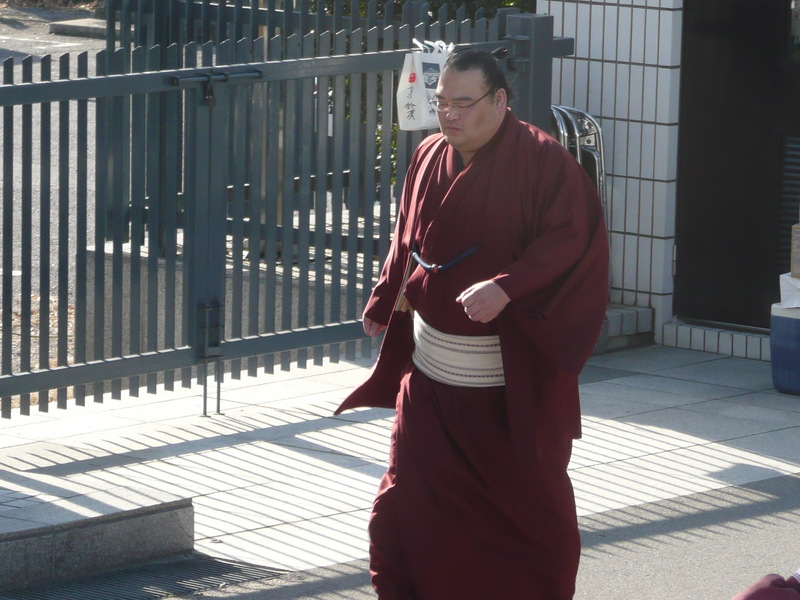 The qualifications that an ōzeki (a rank below Yokozuna) must satisfy to be promoted, are that he has enough power, skill, dignity and grace to qualify. A long standing tradition in Sumo, the Yumitori-shiki (or Bow Twirling ceremony) is a ceremony performed at the end of each the 15 days of a basho where a rikishi twirls a bow in a beautiful dance. 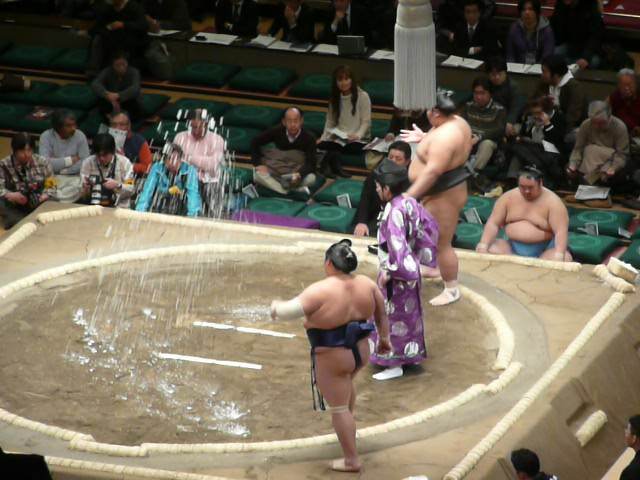 It is performed by a makushita-ranked rikishi from the same stable as a Yokozuna. True fans of the sport will not leave their seats until this ritual is performed. 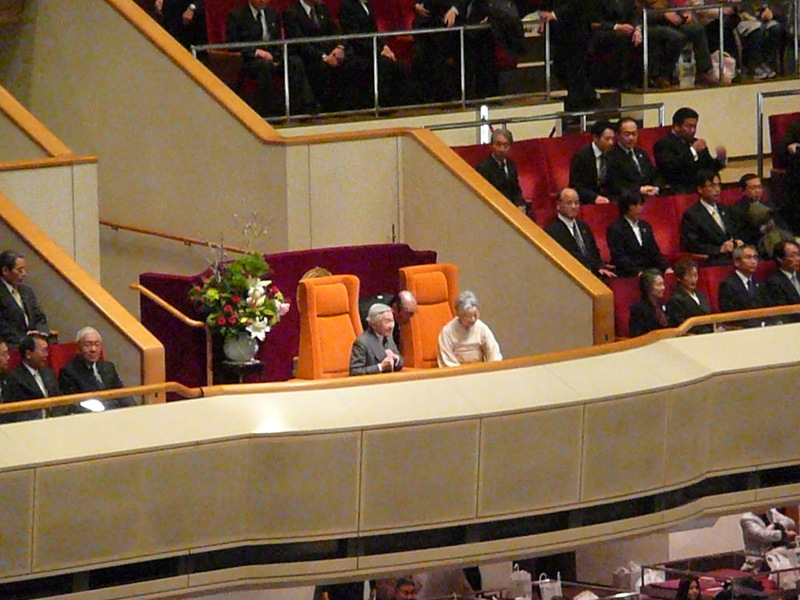 Not bad to see the opening day with Emperor Akihito of Japan and Empress Micihko! 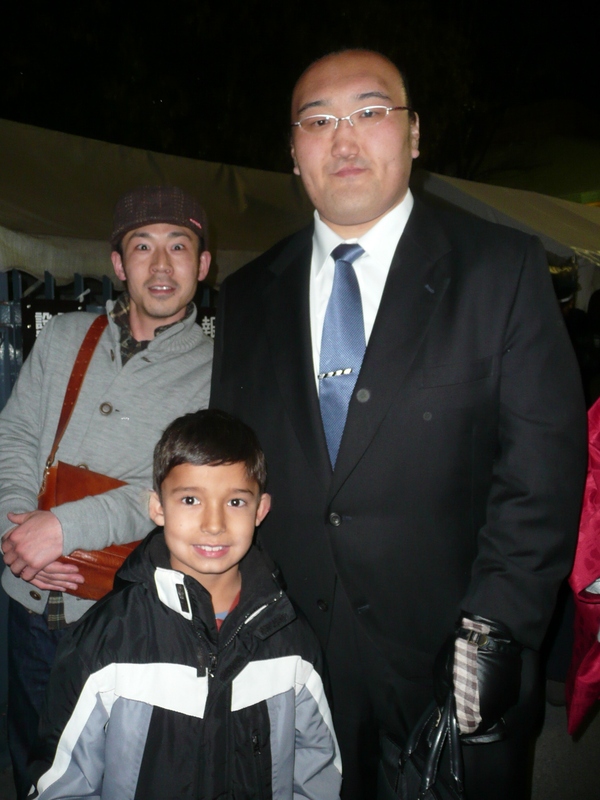 After the event, the wrestlers came out of the venue at the same time as the fans. We saw some people asking them for pictures so we took advantage of their good will and asked them for pictures too. This was an amazing experience for all of us. The boys thoroughly enjoyed it and learned a lot. 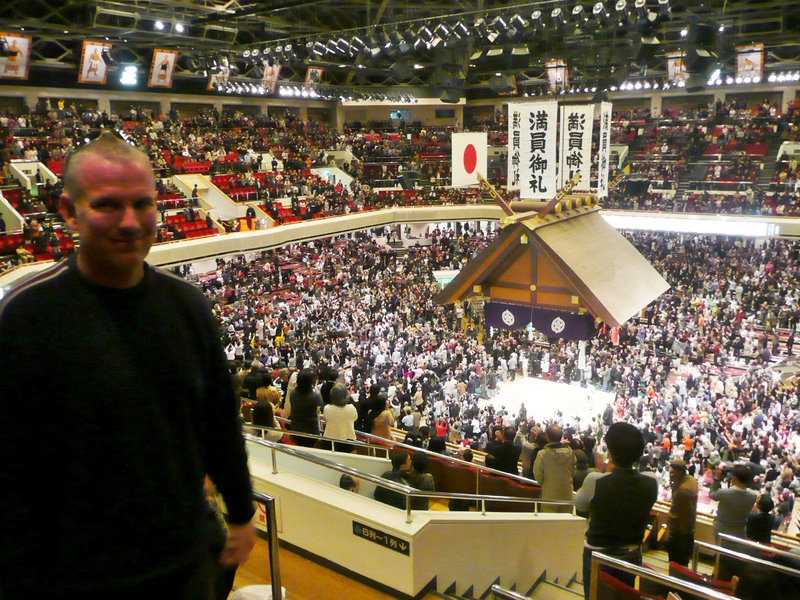 Japan is a country of rituals and traditions and sumo wrestling is no exception. Full of symbolism, it honors the kami and Japan’s Shinto belief. So, no cherry blossoms for us during our winter tour of Japan but hey, sometimes one needs to see some belly slapping, leg pounding, salt throwing and massive body pushing instead. And we loved every second of it! That experience was one of my favorite things during our Japan trip. My boys absolutely loved it. I too learned a lot about the symbolism. I always thought it was just a sport. But then again, in Japan, everything has history and symbolism in it. I’m glad you enjoyed it. Thank you for reading. This is great! 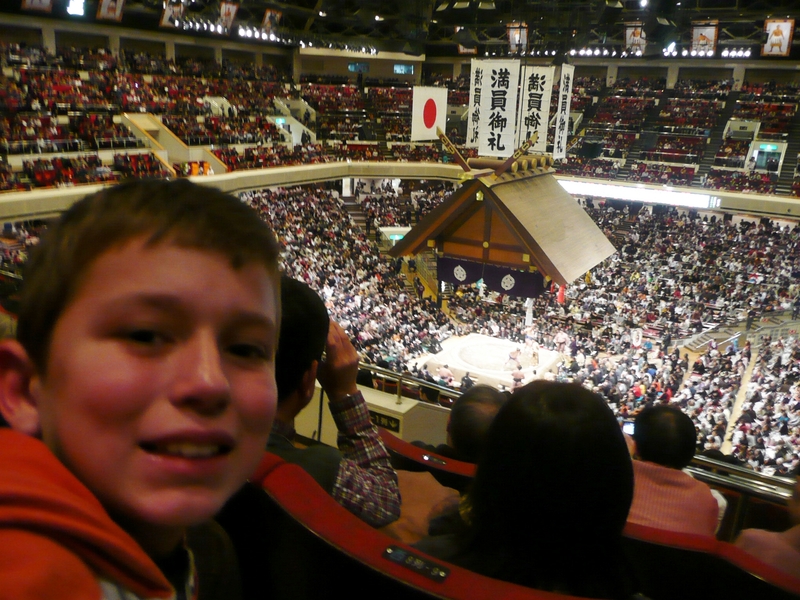 I was considering not going to watch sumo because I thought it would be so boring for the kids, but I think we’ll try it! Thanks a lot! My kids were 9 and 10 at the time. They had a great time. How old are your little ones? Previous Previous post: The lifestyles of the not so rich nor famous in the playground of the really rich and famous. Monaco with kids? Next Next post: While ancient civilizations were flourishing, while Moses was leading Israel out of Egypt, while Jesus was walking the Earth, while Columbus was sailing to America, while man was landing on the moon… Then and now, the majestic Niagara Falls had been roaring with incessable might.